When it comes to Search Engine Optimization (SEO), it’s tempting to focus on a single keyword and attempt to rank very well for it. While this seems like a sound strategy, it causes you to miss out on bigger opportunities to improve your rankings. ‘Keyword grouping’ helps you take advantage of those opportunities. In this article, we’ll explain what keyword grouping is and how using it improves your content’s organization, relevancy, and ability to rank well in Search Engine Results Pages (SERPs). Then we’ll share how to implement keyword grouping for your site. Keyword grouping is the process of creating groups or clusters of related keywords. You can then use these groups to create content optimized for multiple search terms, by using several related terms from a keyword group in your posts or pages. This is beneficial to your site in a few ways. Firstly, it takes advantage of the fact that several search terms could have the same ‘search intent’. For example, consider the searches “Thai food near me” and “local Thai food”, which have the same intent. If your pages are optimized for one and not the other, you’ll miss out on traffic searching for the alternative term, even though your content answers their search. Optimizing for both helps you reach a wider audience. Keyword grouping also prevents ‘keyword cannibalization‘, a process where you accidentally pit your content against itself by using the same keyword for multiple posts. If all your content is trying to rank for one search term, it may be more difficult for any post to rise to the top. Let’s look at an example. Say you run a food blog, and want to create content about Thai food. Instead of optimizing a post only for the keyword “Thai food dishes,” you could use a group of keywords including “best Thai food dishes”, “healthy Thai food dishes”, and “spicy Thai food dishes”. This way you prevent keyword cannibalization, and have the chance to rank for all four keywords instead of just one. This benefits searchers – who are more likely to find your informative post – and you, as you’ll increase your post’s visibility and draw in more users. Keyword grouping has been around for some time, but it used to be quite labor intensive to carry out. Now there are automated tools to help you create keyword clusters, so you don’t have to rely on spreadsheets and your own brain power. To start, you’ll first have to create a list of related keywords you can use to create content. Pick a single search term you want to rank for, or one you already rank for. You can return a list of related keywords in a research tool such as Google Keyword Planner, Serpstat, or SEMRush. Your list will likely be very long. 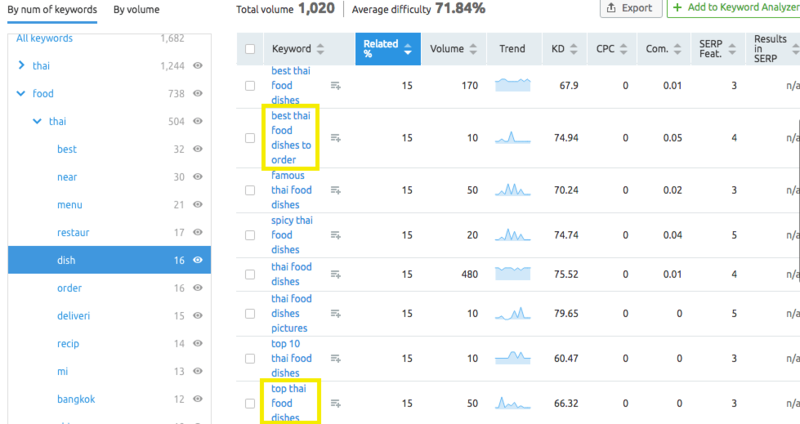 Our example keyword, “Thai food”, returned 1,682 related keywords in SEMRush. Don’t worry, you don’t have to use every keyword that comes up in your list on your site. Once you have your list of related keywords, it’s time to put them in groups, also known as clusters. There are two methods for creating clusters: soft and hard. Which one you choose determines how closely related the terms in your clusters are. Keyword grouping tools cluster terms by looking for how many top search results they have in common. In soft clusters, any two terms can share search results, but not every term has to share results with each other. In a hard cluster, all the search terms must share common search results. Depending on the tool you’re using, you may specify which method you would like to use. Then, you can run the list generated in the first step through a keyword grouping tool such as Serpstat or SEMRush. 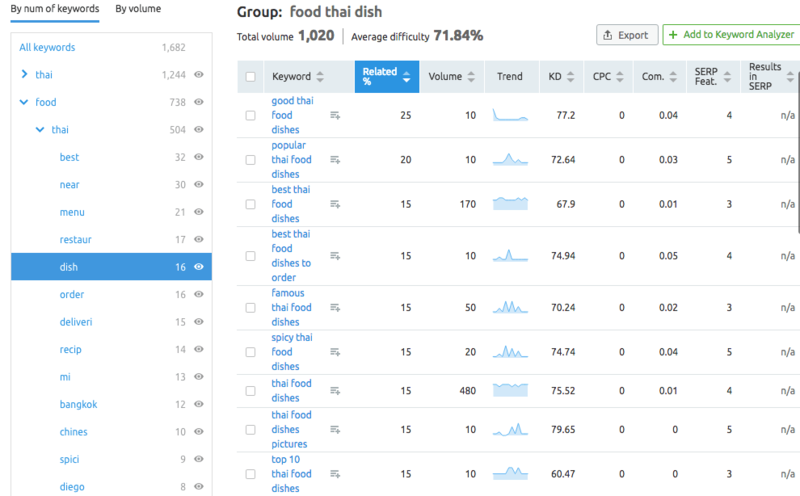 Here, SEMRush returned more than 80 groups for the keyword “Thai food”, each of which break down into more specific subgroups. The subgroup “thai food dish” contains 16 keywords you could use to craft a post on Thai food dishes for the food blog in our example. It’s important to note that these tools aren’t perfect. Of the dozens of groups SEMRush returned for “Thai food”, several referenced specific cities and even street names that may not be relevant to the blog in our example. You wouldn’t want to optimize for irrelevant keywords, so make sure to weed these out of your clusters. However, as long as you apply a little discretion to these lists, they’re still useful and much more convenient than creating groups by hand. Now you have your keyword groups, it’s time to start creating content. As you write your post or page, you can utilize several or all of the keywords in your keyword group for that content. This can be done in a variety of ways. 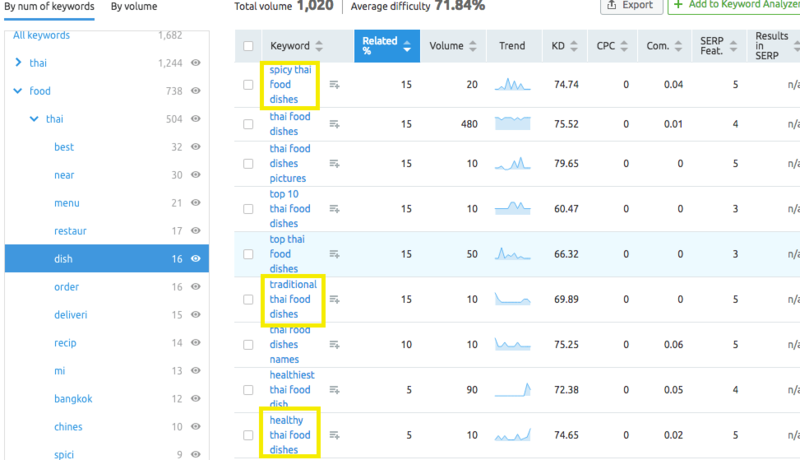 Going back to our Thai food example, imagine you created a post titled “Best Thai Food Dishes” and were using the keyword group for “thai food dishes” SEMRush generated in the previous step. You might include keywords from the cluster such as “best thai food dishes to order” and “top thai food dishes” as variations on the title. Including these in the body text will diversify your language and help your post rank for these search terms. Likewise, you might use “spicy thai food dishes”, “traditional thai food dishes”, and “healthy thai food dishes” in subheadings and sections throughout the post. This will help organize the content in the post and give you a chance to rank for more terms. It’s important to note that using keyword groupings to create a strong content strategy can’t replace high quality content. It’s still important to produce posts that are accurate, optimized, and relevant to your users. As always, simply jamming posts full of keywords won’t help your content rank. While it may seem overly complex, keyword grouping is a vital SEO strategy. By building relationships between your content and helping your site rank for more keywords, you can move your way up towards the top of SERPs. Compile a list of related search terms. Create clusters using a keyword grouping tool. Build content around your keyword groups. Do you have questions about keyword grouping? Ask them in the comments section below! Nice article, it updates me lots of knowledge. Thanks for sharing your experience. Nice article. Would you recommend Yoast premium for helping with this? Yoast is good for helping you gain insight with your groupings and SEO. Your on page SEO or keyword groupings, as described in the article, need to be on point. There is nothing wrong with tools to help you focus in a little better. At the end of the day, if you rely on the tool instead if getting it right on the page you can and will miss out on a lot of opportunity to gain traction in the SERPS. I’ve often thought through how to implement this. Your blog post makes it easy to organize my thoughts and do just that. Thanks for posting this information. I have been focusing on SEO improvements on my photo booth company website and this is a great resource. Glad we could be of service, Mark! Excellent post! I have found many businessmen struggling to rank their website on top of the SERPs via SEO. Targeting a particular keyword is a traditional approach, and the strategy has been changed today. To get more audience on the web, we have to focus on different search terms that people use to find desired results. So, it is good to incorporate possible search terms related to the keyword you focus within the content you prepare. This article clearly specifies the way you need to be done. I appreciate for the useful post and thank you for sharing. Great blog post. Is there any other tool we can use for creating keyword groups. What about ubersuggest, is it good enough? Thanks for the blog article. Very simple manner explained the keyword strategy with the examples. Though I’ve been trying for my sites, but it’s more clear for an individual to understand and implement this concept. thanks again. Hi John Hughes , its good ideas for a business thoughts , thanks for sharing such a great info. First of all thanks for this eye-opening feature from serpstat. I have serpstat plan availed from Appsumo but I didn’t really use this awesome tool to the fullest. Now I am going to use this and make more keyword grouping articles and rank for more keywords.